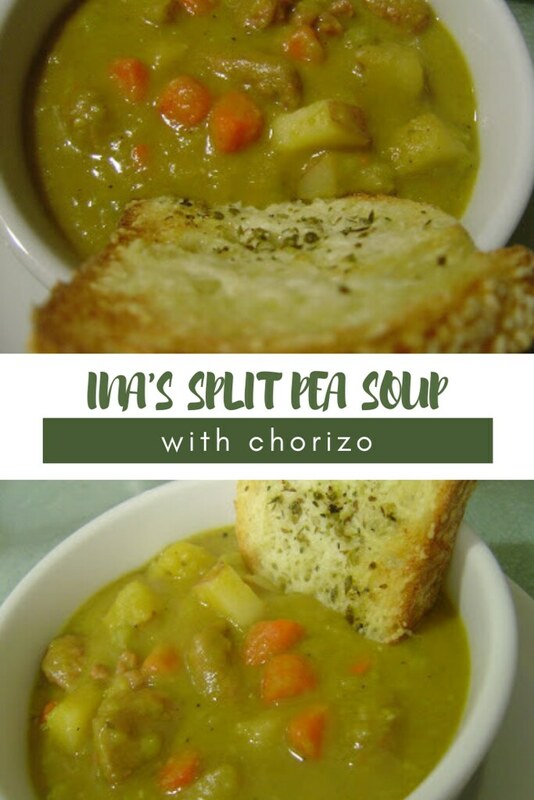 Ina’s split pea soup is a classic recipe and my addition of chorizo in place of the traditional ham takes this soup from great to unforgettable in a matter of no time at all! 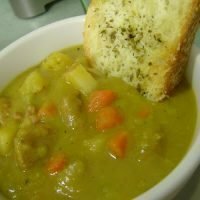 Well, really, this recipe is called Parker’s Split Pea Soup. But I figured, who knows who Parker is just by reading the title of this post? But we ALL know Ina, don’t we?? 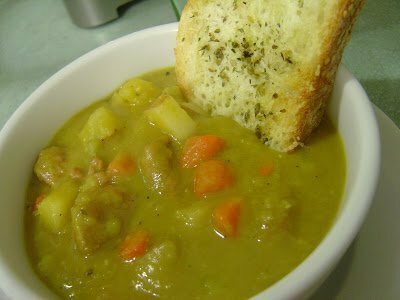 Did I ever mention that as a kid, I would groan when I found out that split pea soup was on the menu? I mean, I haaaated split pea soup as a kid. I’m not sure if if was the fact that it was just so…green? Or that it had ham, which I also loathed. Yeah well, all of a sudden a few weeks ago, I felt this indescribable need to make split pea soup. Like, I could.not shake the craving I had for this soup! I’m really not sure what brought this insatiable craving on, but I went out and bought a couple pounds of dried split peas and some chorizo sausage to add to Ina’s split pea soup. The chorizo sounded like an excellent idea in place of the ham the recipe called for and the hot dogs my mom often added to split pea soup when I was a kid when she didn’t have leftover ham in the fridge/freezer. I then promptly put the recipe on hold – procrastinate much? – until Kyle and I returned from our vacation. The first night back, I made this soup. It was a simple recipe and required minimal time from me standing over the stove which made it the perfect choice for a meal on a night where I definitely didn’t feel like cooking. And OMGoodness. I can’t describe how incredible this soup turned out!! It’s seriously one of the best soups I’ve ever had, let alone made because as we all know, my soup skills aren’t quite up to par. 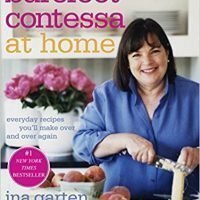 I halved the recipe from The Barefoot Contessa Cookbook which still yielded a ton of soup and there were plenty of leftovers, which neither of us minded at all. The soup was thick, flavorful, and the chorizo was a wonderful smoky addition. This will definitely make a appearance on my menu again soon and next time I might add some biscuits for dipping! If you’re looking for other really great hearty soups for winter, you need to try these! Ina's split pea soup is a classic recipe and my addition of chorizo in place of the traditional ham takes this soup from great to unforgettable in a matter of no time at all! 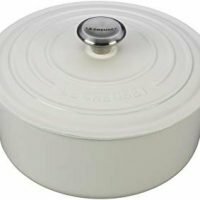 In a 5-quart Dutch oven on medium heat, saute the onions and garlic with the olive oil, oregano, salt, and pepper until the onions are translucent, 10 to 15 minutes. Add the carrots, potatoes, ½ pound of split peas, and chorizo and cook, stirring occasionally, for 3-4 minutes. Pour in the chicken stock and scrape up the bits on the bottom of the pot. Bring to a boil, then simmer uncovered for 40 minutes. Skim off the foam while cooking. Add the remaining split peas and continue to simmer for another 40 minutes, or until all the peas are soft. 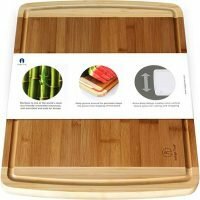 Stir frequently to keep the solids from burning on the bottom. Season with salt and pepper to taste. Serve hot. I swapped out split pea soup's traditional ham for chorizo in this recipe and oh boy this was a great decision! Don't bother trying to find fresh chorizo; just go with the pre-cooked links you can find just about anywhere these days. Alternatively, cut up hot dogs work too and they're super nostalgic as well! sounds yummy! 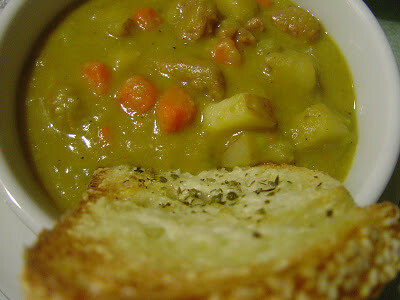 I also thought that I didn’t like pea soup, but recently tried it again when my mom made it. She simmered beef short ribs in the soup – yum! I’ve never had pea soup – but it sounds like everything I love in a soup. I’ll have to “man up” and try it. Hi Gale! I’ve never tried this but if you’re familiar enough with making soup in the slow cooker, I don’t see why this wouldn’t work! Please let me know how this turns out for you! Enjoy!